Home / Self improvement / Is the cholesterol in eggs bad for you? Eggs are a nutritious and delicious food but many avoid them because “they have cholesterol.” Is it so? Is the cholesterol in eggs bad for you or is it just another myth? How nutritious is an egg? 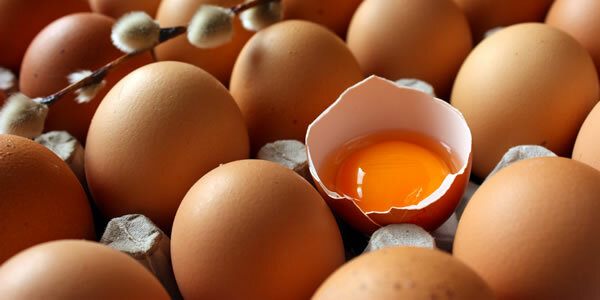 The main feature of the egg is the high content of valuable proteins. Moreover, the egg is a good source of selenium, vitamin B2, iron, molybdenum, vitamin B12 and vitamin D.
The egg yolk provides 200-240 mg cholesterol. However, according to latest analysis, published by the U.S. Department of Agriculture (USDA), the average cholesterol contained in an egg today is 186 mg and is 14% less compared to the cholesterol content of eggs measured in a similar Analysis by the USDA in 2002. It is assumed that this change is due to the use of more sophisticated farming methods. Over the past 2 decades more and more studies show that eating eggs, even on a daily basis (one egg a day), did not significantly affect cholesterol levels in the blood provided that the overall diet is low in fat, especially saturated fat . It is now accepted by scientists that what affects our cholesterol levels is the consumption of saturated and trans fats and not the cholesterol intake from food. Eggs should not be consumed by those who are allergic to them. The egg-whites in particular-is a classic food allergen. A boiled or poached egg has 70-80 calories, depending on its size. However, calories increase when other materials such as oil or cheese are added in cooking. For example a fried egg has about 150 calories, while an omelette with 1 egg and chips or cheese has 200-250 calories. How many eggs we can eat in a week? Those who do not have high cholesterol can consume an egg even on a daily basis, but always as part of a diet low in saturated fat. As for those who have high cholesterol, it is recommended to reduce-but not eliminate egg consumption completely. It is advisable to eat 2-4 a week (scattered throughout the week and not all in one meal). Is it true that eating eggs help in weight loss? The egg is one of the most popular foods in many weight loss diets. Indeed, according to a study published in 2007 in the journal «FASEB», eating eggs for breakfast helps in weight loss more than other foods. This may be due to the fact that while it contains few calories it is causing great satiety, which reduces the total calorie intake for the rest of the day. What about eggs for kids? Paediatricians recommend that children eat 4-5 eggs a week, provided that they also consume protein through other foods, such as meat and poultry. In other words, the daily intake of eggs is not necessary. The yolk of the egg is introduced into the infant’s diet after the 8th-9th month. However, it should be hard-boiled to prevent infection with Salmonella (if this bacterium exists in the egg). After the first year, the egg white can be added in the diet of the child as well. The delay of one year is because the proteins in egg white are implicated to cause allergies. In addition, if a child has a family history of allergies, eggs should be added to the diet after the first year. For how many days are the eggs kept fresh? The eggs can be preserved in the refrigerator for 28 days from the date of manufacture as indicated on the packaging. Nutritional losses suffered during this period are insignificant if placed in the refrigerator right after purchase.